DIG THIS: Waikato University bestowed an honorary doctorate on Hamilton Gardens Director Peter Sergel at the May graduation. 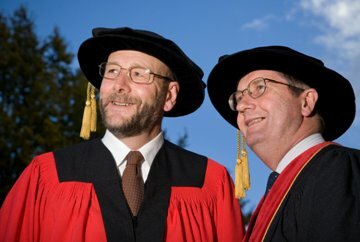 He is pictured here with Vice-Chancellor Professor Roy Crawford. The man who masterminded the Hamilton Gardens is the latest recipient of an honorary doctorate from the University of Waikato. Peter Sergel has been involved in the Hamilton Gardens for more than 20 years, the past 14 as the Gardens Director. He has guided their development to create a venue that is now much-visited and internationally acclaimed. University Vice-Chancellor Professor Roy Crawford says Mr Sergel is a creative thinker who has worked to transform what was a former dog-dosing strip, sand quarry, go cart track and rubbish dump into a 58ha park that contributes to the social, cultural and economic life of the city. "The international accolades the gardens receive are due in a large part to Peter's genius,” he says. “They are gardens that are used, not just looked at, and day after day they attract thousands of visitors." Dr Sergel says he was very honoured to receive the award. "However, there are many people who can share the credit for Hamilton Gardens. It's rather like the bouquet that is handed to the conductor of an orchestra largely because they stand on a box at the front waving their arms around." Dr Sergel has always kept the community involved in the gardens' development by setting up small, single purpose trusts to finance specific projects. He says the next potential project is the development of the three fantasy gardens; a Tropical Garden, a Tudor Garden and a Surrealist Garden. "A new trust has recently been established to support and raise funds for this project but the Hamilton City Council will be deciding if they want to proceed with the project in the wider context of the Ten Year Plan." Recently, Dr Sergel was made an Associate of Honour of the Royal Institute of Horticulture. He is chair of the Board of Trustees at Southwell School and founder of the Hamilton Gardens Summer Festival and Pacific Rose Festival.